The last two weeks witnessed the resignation of Speaker of Ethiopian parliament, Aba Dula Gemeda, and the advisor to the Prime minister, Bereket Simon. Now Patriarch of Ethiopian Orthodox Tewahdo Church told his aides and loyal within the church administration that he is resigning starting next week, according to a report by Wazema radio which cited seemingly well-placed sources within the church. He is expected to present his resignation letter next week at the Holy Synod meeting. According to the source cited above, the patriarch did not have an easy time during the 36th Sebeka Gubae meeting ( annual meeting of congregations of the Ethiopian church across the country) where administrative bodies including bishops present evaluative reports about planned projects and implementations and other administrative issues. Abune Mathias’ apparently felt that he is not exercising his power due to disobedience by members of his administration in the church and that his directives and decisions are not implemented. Added to that is feud he developed with Mahibere Kidusan, an association which was established more than twenty fives years ago with authorizations from influential bishops, which was later recognized as a legitimate body by the synod. While Mahibere Kidusan is endorsed by many bishops in the Holy Synod Patriarch Mathias sees it rather as a “colonizer” with a hidden agenda. It carried out many projects that are relevant to the Church’s gospel service and many bishops rather see this body as defenders of the Ethiopian church faith. Recently, the association started transmission on Alef Television but the patriarch was not too happy about it and he banned the new TV. But his directive was not holding root and the TV program was not banned. Lobbying government authorities to secured the closure of the television station did not bear fruit either. On the patriarch is criticized for being too lenient to defend the faith of the Ethiopian Church and resist politicization of the church through the intervention of the ruling party. Apparently, it was the government that reacted first to the news of the resignation of the patriarch. It sent a delegation to the patriarch to reconsider his decision in view of the crisis that the country is in. The government delegation advised the patriarch to resolve issues with discussion, according to Wazema. He is also criticised for the inability to reverse corrupt practices and ethnicization of church administration which was started during the tenure of the late Abune Paulos. The seventy-six-year-old patriarch was placed as the six ( there is controversy surrounding it) patriarch of Ethiopian church (Ethiopian Orthodox Tewahdo Church) in 2013 after the sudden death of Patriarch Abune Pawlos. Abune Mathias served as bishop of the Ethiopian Church in Jerusalem for so many years before assuming patriarch position – a process which was not without controversy and political intervention from the ruling Tigray People’s Liberation Front government. Although the political aspect of the way he became a patriarch was criticised, many members of the church hesitantly accepted his election in view of pious religious life he led at Jerusalem. Things started to go wrong when he kneeled down to the political intervention of the ruling party and ultimately embraced their ideology. After the fall of the imperial government, which was in a way seen as a defender of the Ethiopian church, attempts to make the church as a propaganda tool for the government never succeeded. After the 1974 Ethiopian revolution, Abune Tewoflos was murdered by socialist Derg government. There were attempts to make succeeding patriarchs champions of Colonel Mengistu’s government but it never succeeded. 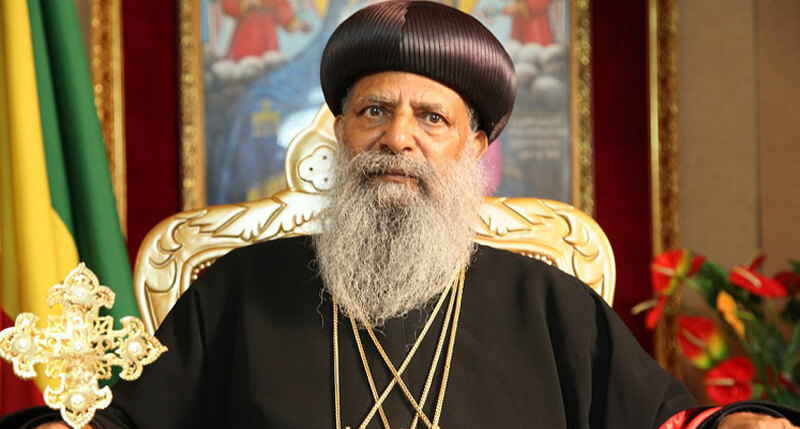 After the fall of the military government, the 4th patriarch was, it is alleged by the patriarch and confirmed by former prime minister Tamirat Layne, compelled to leave the country and the synod that was formed in the United States excommunicated the 5th patriarch, Abune Paulos, who is believed to hold power because of involvement of Tigray People’s Liberation Front. Like the late Meles Zenawi, the fourth patriarch Abune Paulos was from Adwa town, Tigray region. Ethiopian Church is one of the ancient church on earth and is in communion with oriental churches including Syrian church, Armenian church, Alexandrian church (Egypt), Eritrean Church, and the Malankara Orthodox church in India.